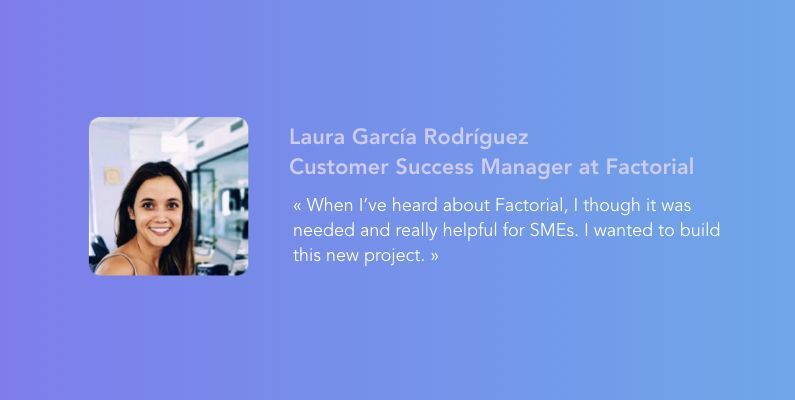 Laura, 28 years old, is working in Factorial as a Customer Success Team. Through contacts with customers, she teaches them how to use Factorial and how the software can help them on a daily basis. If consumers have any doubts or questions, she is the contact person trying to fix the problem with them. Today, the platform offers various HR-related services, including payslip, benefits, etc. 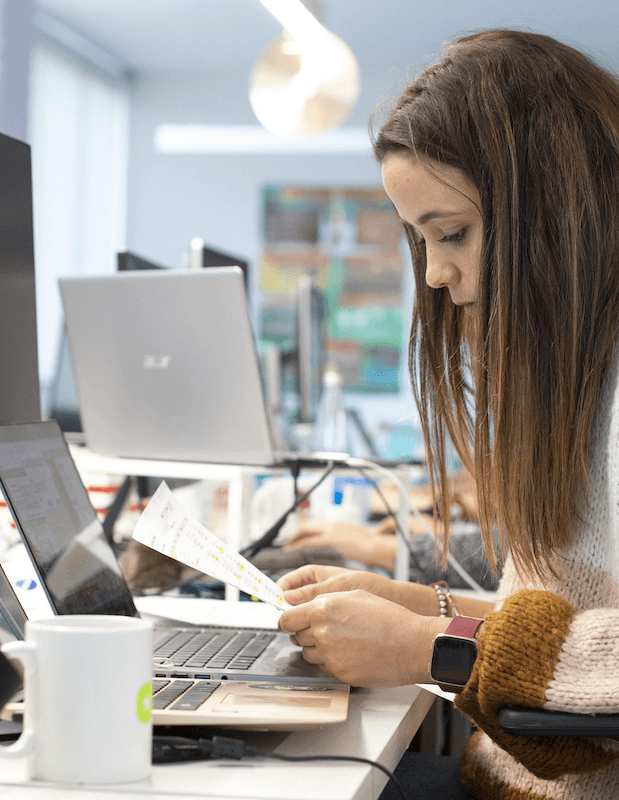 Laura helps customers use correctly all these activities to make the most out of Factorial thanks to advice and recommendations. At the beginning, consumers need to be confident with the platform and she introduces them to it. Later, she helps them every month to prepare payslips for employees and with labour advice in case it is needed. “It is like a consultancy role, I explain them how to use the platform but also anything related with HR and employment law”. Laura arrived in the company two years ago, at the very beginning of it. She remembered her first day in Factorial, which was weird for her since she came from an international company. Everything looked so relaxed and friendly to her, like a family. Back in these days, they were only a few people in the start-up, without any operation, sales or success team. It was only the CEO, the development team, one person in marketing and her. At that time, Factorial wasn’t proposing all the services it provides today. Laura was the person in charge of all the consumers and the operational stuff. With the product team and the developers, they improved the product to make more functionalities and make it better for the consumers. 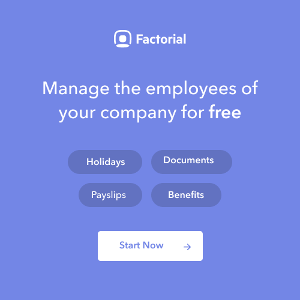 Since the company was growing a lot then, Factorial hired other people to join the sales and operation team. Today, the team divides the clients to get better relationships with them. Laura studied both HR and business, and she worked as HR in an international company in Dublin before coming to Factorial. One thing she loves about her job in Factorial, is that her role is a mix of everything she has done in her whole life. It is about HR, business, process, customers, etc. She also likes being in touch with the technology and loves the people she’s working with. Every day, she has the opportunity to work with all of them in the different departments: product, development, sales, marketing. Sitting with the product team is her favorite moment of the day, she likes questioning them to figure out how to improve the platform for the consumers through technology. Factorial contacted Laura when she was in Dublin. She really liked the project because she wanted SMEs to have the same resources and possibilities like big companies (Benefits offers, HR software). She knew it would be very helpful for the SMEs and she really wanted to build that. Do you want to help us revolutionize HR process? Joins us !